* These top-selling Mariell bridal earrings are what make vintage wedding jewelry so popular! * They boast a jewel-encrusted flare design rich with inlaid CZ stones. 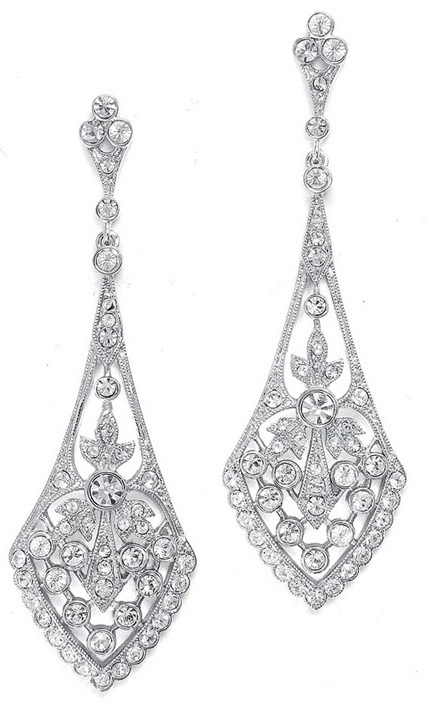 * These dramatic silver rhodium plated earrings measure 2 3/4" for an eye-catching wedding accessory. * Our antique style earrings are also available in 14K gold plating as style 1072E-G.
* This timeless best seller is a must have for any retail bridal boutique! * Reorders are guarateed as are delighted brides!